IAN KUIJT • Department of Anthropology, University of Notre Dame. Notre Dame, Indiana 46556.
of the inherent difficultiesin juggling this intellectual beast, it is understandable that this topic has been bypassed, if not avoided, by archaeologists working in the Neolithic of the Near East. While there are clear exceptions to this trend, for the most part research on the Near Eastern Neolithic has traditionally focused on the origins cf agriculture, descriptive accounts of material culture, and shifts in economic practices, and archaeologists have adopted a position where our discussions of social organization are usually appended to detailed material studies rather than directly addressed. This prioritizing of research is understandable, especially considering the need to document changes in material culture through time. At the same time, however, this has resulted in the current condition under which researchers are only now beginning to explore the complexity, contradictions, and richness within Neolithic communities in early agricultural and horticultural contexts. Viewing this gap optimistically, issues of social organization are now among the best-kept secrets of the Neolithic of the Near East and, at the same time, a topic in which there is a phenomenal research potential for those willing to take their turn at juggling this problematic beast. The researchers contributing to this volume have accepted this challenge and, by engaging in such debate, further our understanding of the multiple pathways toward social inequality and changing social organization in early agricultural contexts. Ultimately,such a reconceptualization of the Neolithic as a social and an economic process is important to a broader readership, for it helps us to understand some of the possible links between population aggregation, sedentism, and social change, how social differentiation may have emerged from within an egalitarian ideology, the mechanisms by which authority was ceded by individuals to groups in precomplex chiefdoms, and how changing social relations were negotiated through the built environment, and mortuary and ritual practices. This challenging discussion augments and enriches our understanding of the ecological, subsistence, and economic dimensions cf the transition from foraging to farming and, perhaps more importantly, presents other researchers with the opportunity to reflect on data sets from other geographical and temporal contexts and the theoretical models currently employed in interpreting the emergence of social differentiation. The primary objective of the research in this volume, then, focuses on the examination of the nature of social systems during different periods of the Neolithic by archaeologists working in the Near East. The authors address fundamental questions concerning social relations during a period of great social, economic, and technological change. They explore dimensions of Neolithic social organization on the basis of current archaeological data rather than labeling or interpreting Neolithic social systems through the lens of previously defined ethnographic categories such as chiefdoms. This does not imply a rejection of important ethnographic categories, nor the use of a comparative approach. I believe it reflects the recognition that any interpretation of Neolithic social organization must be founded on archaeological evidence and require integration of broader ethnographic and anthropological understandings of the human context in agricultural communities. Such intellectual balancing of archaeological data of the Neolithic with that of the anthropological understanding of social systems presents the contributors with a very challenging task and, by its very nature, illustrates a range of methodological approaches archaeologists adopt to study the scale, nature, and relative complexity of relationships within and between Neolithic communities. It can be argued that behavioral or social interpretations in archaeology stand or fall on the basis of the material data, that is, their careful placement in time and space. For the Neolithic Near East there is no clear consensus as to which data sets should be used to create cultural-historical sequences or the duration of individual periods or subperiods of the Pre-Pottery Neolithic. The reasons underlying these debates are complex and linked to the geographic scale and perceived cultural differences between Neolithic occupations from different areas of the Near East. 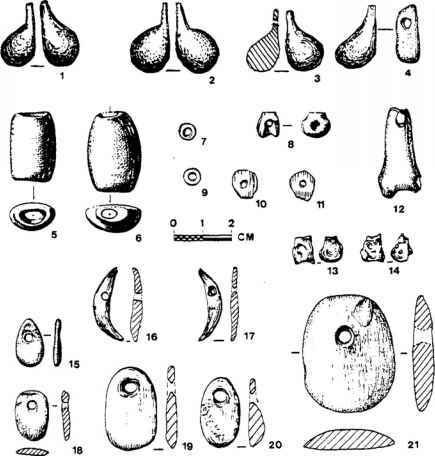 In general, archaeologists disagree over what types of material evidence, such as architecture or lithic technology, can and should be employed to subdivide the Neolithic into different cultural-historical phases (see Figures 1 and 2). Stordeur et al. 1996;Watkins et al. 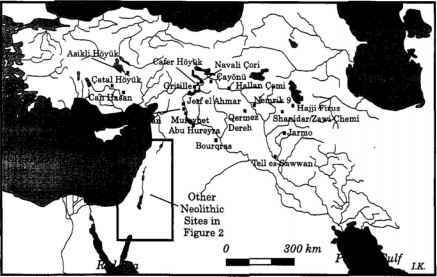 1989) provided us with an understanding of the development of a distinctive culture along the Taurus-Zagros flanks during the eleventh millennium and how these may have been culturally articulated with later communities in areas of Iraq, Turkey, and Syria. Combined with the exciting field work at other settlements with later occupations, such as Nevali Cori, Gobekli Tepe, and Gurcutepe (Hauptmann 1993; Schmidt 1996), and the very important regional Neolithic research project centered on Catal Hoyuk (Hodder 1996), archaeologists are now beginning to explore variations in material and social adaptations within and between different geographical areas of the northern Levant and Anatolia. Figure 2. Location of Pre-Pottery and Pottery Neolithic period archaeology sites in the south-central Levant. bp. Prioritizing different lines of archaeological evidence, researchers continue to debate how, or if, these periods should be further subdivided or labeled. For the PPNA, for example, some disagreement exists whether this period should be subdivided into two different phases or treated as a single cultural-historical unit. Similarly,researchers disagree if the broader PPNB should be subdivided into two or three phases. (For detailed discussion of cultural-historical sequences of the PPNA readers are referred to Bar-Yosef 1991; Crowfoot-Payne 1976, 1983; Garfinkel and Nadel 1989;Kuijt 1997a; Nadel 1990. Description and discussion of cultural-historical sequences for the general PPNB are covered in Bar-Yosef 1981; Gopher 1994;Kuijt 1997b; Rollefson, 1989. Discussion of the cultural-historical period of the PPNC, which is alternatively termed the Final PPNB, is presented in Nissen 1993; Perrot 1993;Rollefson 1989; Rollefson and Kohler-Rollefson 1993a, 1993b.) In the northern Levant and Anatolia archaeologists have uncovered evidence for similar, yet different, material patterning for the development of the Pre-Pottery Neolithic period. According to Cauvin (1987), a similar expression of the PPNA appears to have lasted from 10,300to approximately 9,600bp, as illustrated by the excavations at Mureybet, Qermez Dereh, and Nemerik 9. In the northern Levant and Anatolia the Pre-Pottery Neolithic B period can be tentatively divided into (1) the Early Pre-Pottery Neolithic B (EPPNB) (9,600-8,500 bp), (2) the Middle Pre-Pottery Neolithic B (MPPNB) (9,300-8,500bp), (3) the Late Pre-Pottery Neolithic B (LPPNB) (8,50043,000 bp), and, (4) the Final Pre-Pottery Neolithic B period (8,000-c.7,500 bp), although also see Moore (1985) for an alternative cultural-historical system (Figure 3). In placing archaeological materials in time and space, researchers working in the prehistory of the Near East are faced with the unenviable task of searching for consensus among their colleagues in constructing cultural-historical sequences, often drawing on data from different geographical areas before moving on to the more rewarding task of reconstructing past social phenomena. 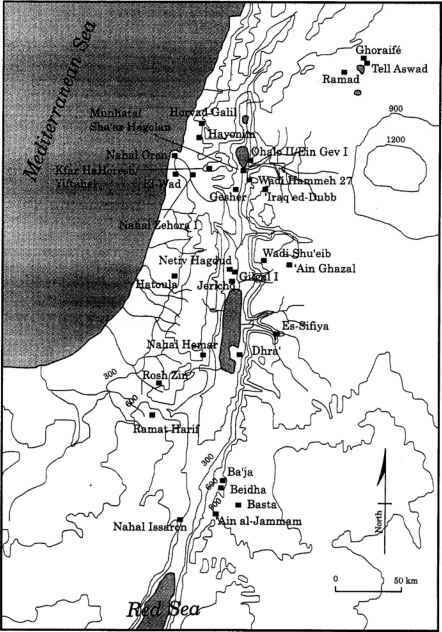 In many cases, such as the south-central Levant, disagreements do not focus on material patterning from individual archaeological sites; rather they rest on what is perceived to be appropriate data sets for creating cultural-historical sequences. In recognition of the ongoing nature of this discussion, no attempt is made in this volume to present a revised all-encompassing chronological sequence for the Near East. Moreover, these chronological debates, although important to researchers for understanding subtle changes through time, by no means detract from the general consensus as to the overall reconstruction of the transition from various Epipaleolithic through Neolithic cultures in different areas of the Near East.